Fossil teeth can tell palaeontologists a great deal about the potential diet and even the identity of an extinct animal. The shape of the crown of the tooth and the way a tooth is attached to the jaw are functionally and evolutionarily important features that are well studied for many groups, including mammals and dinosaurs. My interest in teeth is in their tissues and how these have changed to suit their functions. We know so much about how teeth develop and what tissues make up a tooth in mammals, because of the immense amount of research in modern dentistry. I want to take what has been learned from developmental work on modern mammals and apply it to the fossil record. The teeth of mammals are complex organs made of five tissues: enamel, dentine/pulp, cementum, alveolar bone, and the periodontal ligament. Enamel is the hard white cap of a tooth that we brush (and maybe whiten??) everyday. Dentine underlies the enamel and makes up the bulk of a tooth. It’s the dentine and its core of soft pulp that give our teeth their sensitivity. The other three tissues (cementum, alveolar bone, and the periodontal ligament) form what’s called the periodontium. The role of the periodontium in mammals is to hold teeth in the jaws and assist with changes in tooth positioning over the lifetime of the tooth. Each of your teeth is suspended in its socket by the periodontal ligament: a network of tiny collagen “cables” that hold the tooth in place. Its job is to cope with the everyday stresses of chewing and to make constant minor adjustments to the position of the tooth within the socket. Put too much pressure on one side of the tooth and these ligament fibers will tug the tooth in one direction. If you’ve ever had braces, you should be happy that you have these tissues. Otherwise, it might have taken your whole lifetime for the teeth to move. The only reason your teeth were able to move at all is because of the springy connection of your teeth to their sockets. Most reptiles aren’t so lucky. This is a section through a fossil mammal tooth. If you look closely, you can see that the tooth doesn’t touch the walls of the jaw. That’s because a soft ligament normally suspends the tooth in place. Since this is a fossil, the ligament is long gone, but the space is still there. Closeup of the same tooth (left) and jaw bone (right). Note the space between the tooth and the jaw. That’s where the ligament would have been. All of the tiny dots in the bone are spaces left behind by the bone cells that used to be found all over the bone. The larger worm-like gaps in the bone are the spaces left behind by blood vessels. The evolution of the periodontal tissues in fossil reptiles is what interests me most. I’m interested in tracking these tissues back through time to understand what aspects of tooth development have changed and what features have been conserved during the course of mammalian and reptilian evolution. Since the time of Sir Richard Owen (1840), it’s been widely accepted that the three-part periodontium of mammals is among the most complex when compared to other vertebrates. Many surveys of “reptile” teeth over the last several decades have argued that reptiles only have a layer of bone that fuses the teeth to the jaws. I have been arguing quite the opposite. My work on the earliest herbivores (LeBlanc and Reisz, 2013) has shown that most reptiles have a three-part periodontium that looks remarkably similar to that of mammals (maybe braces would have worked on these ancient herbivores!). I have also looked at examples in the fossil record where teeth form a large, complex grinding battery in some early reptiles (LeBlanc and Reisz, 2015) and the duck-billed dinosaurs (LeBlanc et al., 2016). These are some of the most complex dentitions we know of. Understanding how they worked (they continuously added and removed teeth from these batteries) and how they evolved from a more simple dentition is an ongoing aspect of my research. Teeth come in a variety of shapes and sizes to suit a particular diet. Many herbivores have complex grinding teeth to help them pulverize tough plant material, whereas many carnivores have sharp, blade-shaped teeth with serrated edges to help tear and cut through flesh. These are tooth-level dietary adaptations, but there is another class of evolutionary changes to teeth that are fairly understudied. I call these dentition-level changes and they often take the form of structures called dental batteries: amalgamations of several generations of teeth to form a single, more complex grinding surface. In essence, each tooth contributes to a larger surface (usually for grinding plant-material), allowing the dentition to behave like a single, giant tooth. So far I have studied two kinds of dental batteries: those in the Early Permian (circa ~289 million years ago) reptiles known as captorhinids, and those in the Late Cretaceous duck-billed dinosaurs. The multiple rows of teeth in the early reptile Captorhinus. Each new row is added beside the older one by a unique, conveyor-belt motion of jaw growth. The teeth themselves don’t move, but the underlying bone of the jaw does. 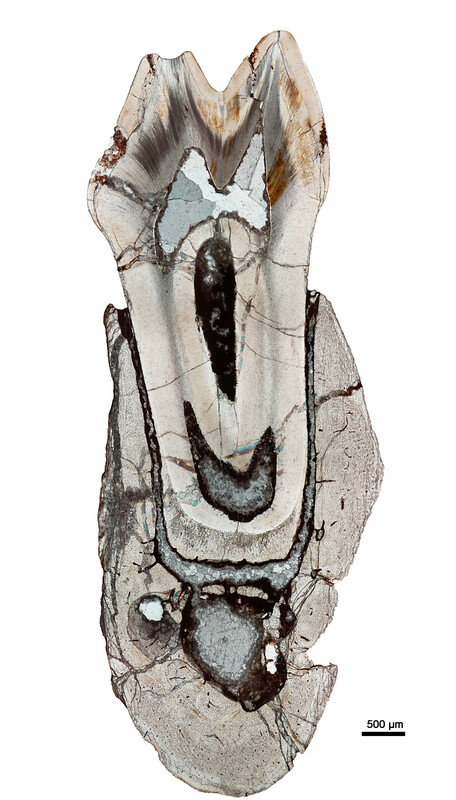 The bottom two images are of a dentary and a maxilla of Captorhinus in thin section, showing the multiple tooth rows. Captorhinids were small reptiles that had multiple rows of teeth that stretched across the upper and lower jaws. Because of their abundance in the Permian period, it’s clear that the evolution of this structure was a key to their success and I have been interested in determining how such a dentition arose. 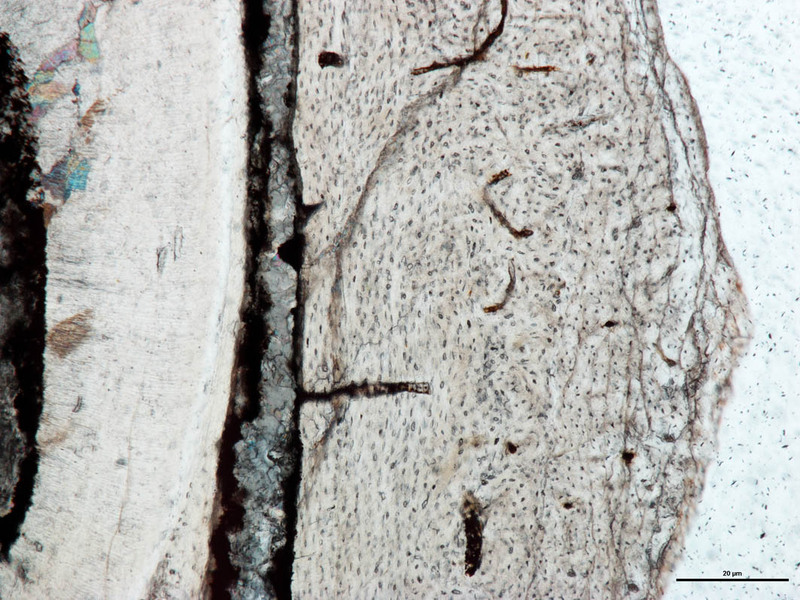 Thin sections have been the key to understanding how a reptile can maintain multiple rows of teeth, and the work that I have done so far has shown that it is the jawbones themselves that carry the teeth in a conveyor-belt fashion across the jaws over time, allowing new teeth to form on one side, and older teeth to fall out of the jaws on the other. Hadrosaurid dinosaurs exhibit another kind of complex dental battery. These structures are formed from vertical stacks of teeth that are all interlocked together and move in unison up to the chewing surface to be ground down. There has been a lot of interest in how these dental batteries worked, but my (and colleagues) research has been the first to directly investigate the internal anatomy of these structures at the tissue level. We did this by making thin sections of entire batteries to see how each tooth went from a small tooth bud at the base of the battery to becoming part of the grinding surface. It turns out that each of these teeth didn’t actually physically touch each other. Instead, a system of soft ligaments pulled and anchored each tooth within the battery and allowed the whole thing to behave like a single tooth. As for future work, I intend to investigate other kinds of complex teeth in other reptiles. There are a number of ways that teeth and dentitions have evolved to cope with challenging diets (usually herbivory), and many of these unique dentitions exist only in the fossil record. Studying these complex dentitions can tell us a lot about the versatility and adaptability of teeth. My Masters thesis work in the Caldwell Lab introduced me to the mosasaurs. These were giant lizards, some pushing 13 meters in length or more, that were adapted to spending their whole lives in the water. My interest lies in the anatomy and phylogenetic relationships of a subfamily called the Mosasaurinae. Describing new species and re-evaluating existing ones are necessary first steps to figuring out their evolutionary history. I’ve had some experience in that regard, but I am also interested in their biology. Mosasaurines show a wide array of feeding specializations, which are reflected in their tooth shapes. Some appear to have been generalists, eating fish and invertebrates, others were specialized for crushing hard-shelled prey. Still others had a meshwork of teeth for capturing small fish. I am also interested in studying aquatic adaptation. Walking around on land poses a different set of problems to land-dwelling vertebrates (tetrapods) compared to vertebrates that swim and feed in water. Aquatic tetrapods, those that have ancestors that were terrestrial, but over time made their way back to the water, face the unique challenges of moving and feeding in a viscous medium. Because these are selective pressures that are common to all aquatic tetrapods, convergence in body form and feeding mechanisms between unrelated aquatic tetrapods are common. Mosasaurs were no exception. Some very interesting research over the last few years has helped transform our view of mosasaurs as big, clumsy-looking sea serpents, to streamlined ichthyosaur-like lizards that were well adapted to cruising the Late Cretaceous seas. We now know that mosasaurs had streamlined bodies, a two-lobed tail for propulsion, and probably gave birth to live young in the open ocean. These new insights have literally reshaped our understanding of these iconic lizards. My contributions to the mosasaur’s story thus far have been to better understand the evolutionary relationships of mosasaurines (LeBlanc et al., 2012), mosasaurine feeding mechanics (LeBlanc et al., 2013), and their reproductive biology (Field et al., 2015). Thanks to the recent work of several experts, mosasaurs have received a bit of a makeover. Forked tails and streamlined body outlines are the rule rather than the exception when it comes to reconstructions. 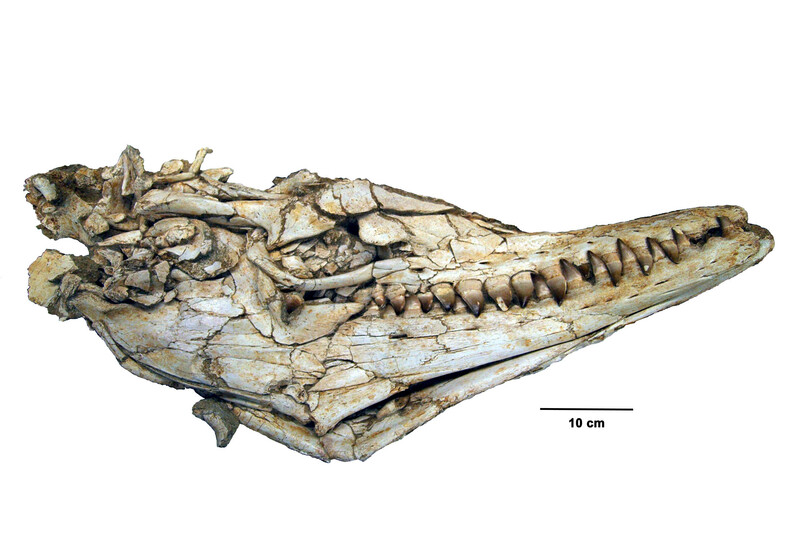 Skull of Eremiasaurus heterodontus, a mosasaur from Morocco.